Wm. Hocker Redcoats Under Fire! As can be seen (although the internet is the worst place to judge colors), Britains red changed slightly over the years with one major anomaly (#3) in the post wars years. Which one to choose for our goods? In the first years of our production I made and attempt to match as closely as possible the colors of the between-the-wars briatins paint style (#2). The faces were ruddy to the point of being grey and the scarlet was bright orange. At one point we even used testor's italian red straight from the bottle since it was a close match (#6). In my showroom I have shelves of old Britains (mostly post war) adjacent to shelves of our own goods. At some point in the early 90's I noticed that the mass of our figures had a consistently brighter look to the red than the mass of the britains figures and decided that our red needed to be toned down. 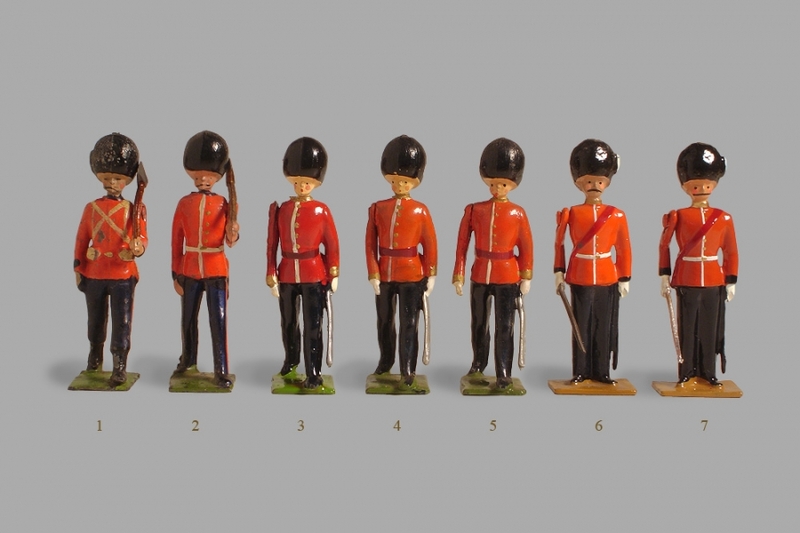 At the same time I finally realized that the grey skin color, while adequate on brightly colored figures, did not give the spark of liveliness to bland uniforms that the Britians post-war flesh did. The 2 changes resulted in the #7 colors we use today. #7 looks right to me. Pre-war Britains rifles were coated with a translucent lacquer (or shellac or varnish) that let the brilliance of the metal shine through (although often it was just the undercoat of flesh color shining through). The early examples are very yellow and become more mahogany as time went on. Post war a muddier and darker form of translucent paint was used. We have used several odd translucent paints over the years all of which have had some drawback. Currently our rifle paint is a mixture of Tamiya X-27 clear red and X-25 clear green. It is the best of any of the paints used as far as translucence and color goes (and because it is readily available! ), but it is extremely brittle when dry and chips easily (as the old Britains lacquer did). It is also a bit gummy to apply, doesn't smell very nice and requires two coats. 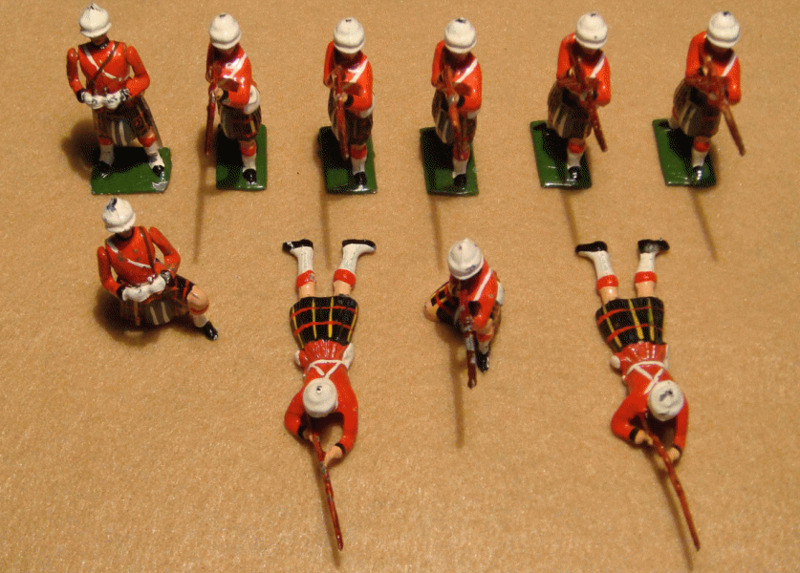 It is the best I have found for "restoration" of old Britains, but I would advise against "restoring" figures of the quality of the figures shown in your photo as it will decrease their value. If you are into Britains restoration, I would suggest finding figures that have already been repainted, strip them and do the restoration from scratch. The colours used by Britains varied quite a lot over the years (hardly surprising over 100+years). Certainly towards the end of production of hollowcasts they use sign-writers paints produced by a company called Keeps (now defunct I think). The paint came in tubes of pigment which had to be mixed with a medium (a type of varnish with a very distinctive smell familiar to anyone who has ever stripped the paint off a Britains figure). I have some examples of Keeps paints and there are at least two shades of red. I cannot recall the �official� descriptions (although I can find out if it is important to you). One is what I would describe as scarlet /poppy. This is closest to your#1, 2, 4 & 5. It is quite an orange tone. The other is darker tone, less orange more like your #3. The latter was used for most postwar figures from the early 1950s onwards. Your figure # 3 is an example of this. The former was used pre war (but also early post war like your figures # 4 & 5). Interestingly, the very early figures produced from 1893 -1900 (much earlier than anything you have in your picture) often used a shade of red more like #3 (if anything more vermillion in tone). Of course the paint can fade and change colour in the presence of tobacco smoke, and other environmental conditions, but for most of the production period the red it is fairly standard and shows remarkably little variation (as your examples #1, 2, 4 & 5 show (they probably span the best part of 40 years!)). Your examples (#6 & 7) look a pretty good match for this to me, although as you say things do look different on the computer to real life. Of course, even if you have a figure in your hand it can vary quite a lot depending on the light conditions. Often what appears to be a perfect match in one light (e.g. natural daylight) can look quite different in another (e.g. artificial light, including but not exclusively a so called �black light�.) This can help to identify retouching, much of which is done in artificial light and therefore shows up best in daylight. I hope this is of some help. Happy to continue the discussion!